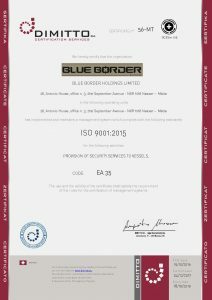 Blue Border Holdings Ltd. has successfully concluded its transition from ISO9001-2008 to ISO9001-2015. Various internal training sessions have also been conducted in order to understand and implement effectively all aspects of the new standards that have been incorporated within our Quality System. The transition process was followed and supported by our QMS Compliance partners, Step Enterprises, who’s professional and dedicated staff made sure that the transition is achieved smoothly whilst maintaining Blue Border’s highest standards all throughout .